According to recent media reports, the hall authority of Shamsunnahar Hall of Dhaka University (a university women’s hostel) and Chhatra League (ruling party cadres) ran a joint night time raid on the 3rd of November, shockingly framing some of the conservative and religiously practicing female students as being associated with Shibir, Hijbut Tahrir, militant extremists etc and later expelling those unfortunate students after allegedly torturing and harassing them. Despite the shocking and unacceptable news, nobody got to know of the terrible and gruesome torture inflicted upon those girls inside Shamsunnahar Hall that day. Just because of the fact that they known to be associated with praying, regular fasting, possessing and studying the Quran and Hadeeth along with having other religious books with them, these students of country’s highest educational institute were subject to barbarian torture. Not only were they beaten that night with sticks and rods; they were derided, jeered at and ridiculed by Chhatra League cadres as well. At the height of being tortured, taunted and ridiculed, they were threatened with being taken to the Gonojagoron stage of Shahbag for punishment, saying that the souls of the martyrs of Bangladesh’s Liberation War would get solace with them being punished. Due to the lack of any credible media coverage, it was not possible to know much about what other shameful incidents took place that day. One or two of those religious girls, taking disguise in wearing T-shirts, jeans pants and makeover, were able to escape the brutal incidents of that day. Others were unable to either defend themselves or have any say against this shameful incident which no doubt was a very traumatic incident for the female students. Three students were detained by the authorities during the raid. The detained three are Umme Kulsum Koli, a 3rd year student of World Religions and Culture Department, Fahmida Akter, a 4th year student of English Department and and Saimun Akter, a first-year student of Journalism Department. Acting proctor of the university, Amzad Ali told the media that the students had books on Jihadi, Maududi and other similar subjects with them. “They have active involvement in such issues. Another student Israt Jahan, who is also involved in these, fled sensing the presence of the authorities,” he said. The proctor said actions would be taken against the three after investigation. 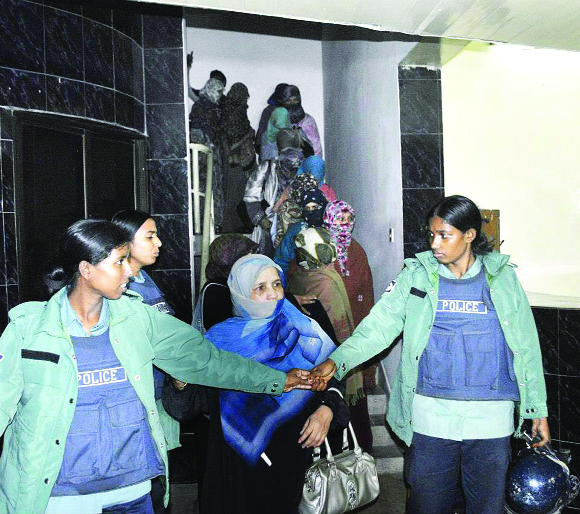 Shamsunnahar Hall Provost Sajeda Banu said the three were detained at the prayer room around 5.00 am based on information from the Chhatra League unit of the hall and other students. “They were found carrying books and documents of Islami Chhatri Sangstha. They will lose their dorm seats temporarily before we hand them over to their guardians,” she added. On further investigation of the matter, disturbing information was found from the write-up of a student who was present during the incident and witnessed the disturbing events first hand before escaping from the premises to save her self. She described that horrific incident she witnessed in a facebook note, which is translated below. From the night of the 2nd November itself, the activities of the Chhatra league in the hall were noticeable. Many female students were taking preparations to fast the following day on the occasion of Ashura. After completing Sahri we were sleeping in a relaxed mood. Suddenly at 8:30 am someone informed us over the phone that Chhatra league female cadres had held 3 girls from the hall’s prayer room and were raiding each room, hunting and capturing any girl who had in her possession the Quran, Hadith books or the like. Some were even held based on only suspicion. The alarming news left with numb with shock. As soon as I came out of my room to see for myself what was happening, I saw a flurry of activity taking outside in the hall. Chhatra league cadres, divided into different groups, were taking positions in different places of the hall, having rods and sticks in hands. I don’t keep Quran, Hadeeth or related books in my room. But it was as clear to me as daylight that I was among the ones they wanted to catch. It was also clear to me that and I was going to get caught before I could finish erasing all religious data / documents from my laptop. So, taking the mental preparation for getting caught and bone dead tired of being awake throughout the last night, I went to sleep again. Some time later, a well wisher pushed me to wake me up, gave me a set of clothes, and said, “Wear these in 2 minutes, then come out. They (the chtaroleague cadres), with sticks, rods and knives in hand, are searching every floor for you along with some others since the morning”. I looked at the clock. The time was then 3:45 PM at noon. I also came to know that most of our sisters were able to get out and that I was the only one asleep. After around 10 minutes when I, wearing my friend’s jeans, T shirt and donning makeup, came out of my room and passed my batchmate Chhatraleague cadres, I saw their reckless looks, and observed their ferocious hunting on every floor while others stood guard at the foot of the stairs on the floors. They were celebrating the capture of some of the most gentle, virtuous and pious girls on campus, dubbing them “Shibir girls” and what not. Whilst escaping from the place and struggling to contain my tears, I could hear them hoarsely sneering that they would take the girls they had captured to Shahbag’s Mancha for the sake of punishment, so that the souls of the freedom fighters of 1971 would get peace. Hearing that, my feet began feeling numb and weighty. At a stage, after I was able to get away to a safe distance from them, I went to the washroom, put on my veil, and walked towards the hall gate. There I saw five security guards standing at the exit gate, with a list of names in their hands. They were checking the ID of everyone getting out of the hall. I realized that when they check to see my id card, I would get caught. My heart reeling with hatred at the injustice, I briskly walked towards them and in an urgent tone said, “’Dadu! I heard that Shibir girls have attacked League girls in the extension building (they call the Chhatri Sangstha activist girls “Shibir”)!!! Don’t you know anything?” Each of the five idiots stared at me in incomprehension, and believing me, ran inside the hall premises to see the conflict. I was able to quietly and quickly run away from behind and with the grace of the Almighty I’ve reached now Bogra safely. I shall forever remember this day in my life.